Beautiful! Pull up a chair, fix a cup of tea, and grab a good book. Yup, I'm there for the day. Beautiful Andrea, you started my morning off with a smile and a happy heart. So beautiful...the pond looks as smooth as glass! Makes me smile! Who can resist a red tractor and a golden field surrounded by green? What a perfect picture! Can't think of a prettier view! Loving the Case IH. Great photo. You should sell a print! 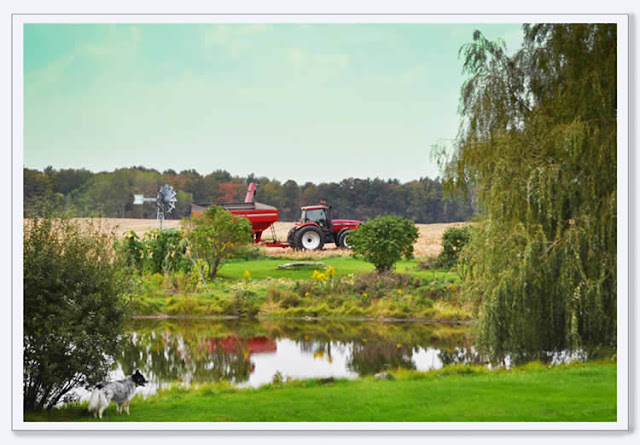 Beautiful photo Andrea-from the tractor to the windmill to the Weeping Willow, such serenity. Have a wonderful weekend. Love to be sitting, silently, by the pond right now... beautiful. This photo warms my heart and makes me wistful at the same time. Isn't that weird? I feel homesick looking at it! Beautiful things do that to me. So beautiful; I love rural photographs. Great job. My parents had a painting..not a photo...almost exactly like that in their home..looks like the farmer said "Time to go eat supper" and just left everything sit until tomorrow..
What a beautiful country picture, looks like a postcard!